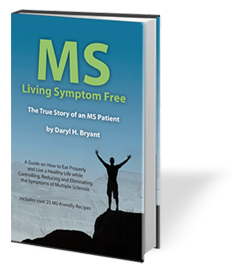 I wrote my book on Multiple Sclerosis, MS Living Symptom Free, in order to help others diagnosed with MS to take back their life. As an active person, I spent my youth playing football, wrestling, karate, golf, tap dancing, and I maintained these active hobbies well into adulthood. So when I was diagnosed with MS, I tried to deny my symptoms. But as I eventually learned the hard way, you cannot ignore a disease like Multiple Sclerosis. 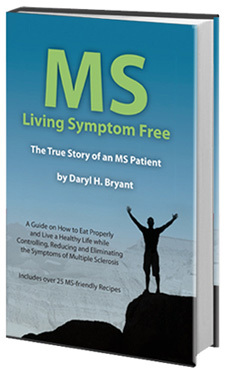 What are Common MS Symptoms? Rather than deny my symptoms, I chose to work through them and figure out how to treat and ultimately prevent my sysmptoms flares from getting worse. I learned to manage my symptoms in a healthy way by changing my diet, staying active, and keeping an open and honest relationship with my family and the health care professionals who work with me to combat the disease. Working through Multiple Sclerosis and living symptom free can be a challenge. It has taken years for me to overcome my symptoms, manage them and continue to pursue my goals after I was diagnosed, but if you are willing to meet the challenge head on and approach your symptoms with optimism, you can reduce your symptoms and take back your life.e - this ultimately allowed me to reduce my MS symptoms and flare-ups. Although there is no cure for MS, there are many foods that help MS and allow you to treat and work to prevent further progression of the disease. Eating healthy is one of the easiest ways we can reduce and manage our MS symptoms and start living a symptom free life with Multiple Sclerosis. You don’t have to stick to a strict dietary plan, but making the right adjustments and healthy snacking can keep you feeling energized and active throughout the day. Fresh fruits, veggies and wheatgrass can make a world of difference when it comes to reducing your MS symptoms, especially during the summer heat. Keep your fridge stocked with fruits and veggies from the season, and don’t hesitate to stock up on frozen vegetables as they can be a delicious time-saver when it comes to dinner time. Most important, it is vital to remove gluten, dairy, and legumes from your diet. Gluten is linked to causing increased inflammation in some patients, and removing wheat gluten from your regular diet can make a huge difference when it comes to your symptoms. When people suffer from a gluten intolerance, our body’s own antibodies attack the gluten as we consume it, which can lead to severe gastrointestinal issues. The same happens to those with lactose intolerances. By removing these items from your diet, you lower the risk of your body going into overdrive in order to combat the intolerance. You’ll notice a significant reduction in your symptoms, especially if you suffer from digestive problems, and your energy will increase as well. When exercising to reduce your MS symptoms, it is important to find a routine that works for you. With the hot summer temperatures, you can have symptom flare-ups caused by exhaustion and over-heating, so if you feel uncomfortable or unable to work out on any given day, don’t be afraid to take a rest. You should only exercise if you feel physically able to do so, and there are many low-impact workouts and yoga positions you can do that will keep you healthy and active without increasing your risk of symptom flare-ups. For example, swimming and aquatic aerobics are a great way to stay cool and active during the summer. If you have an existing routine that works well for the winter, try translating the workouts to water. Deep water aerobics can help you build core strength while practicing jumping jacks, cross-country skiing, and yoga all in the water. Exercising in this way will help you maintain your muscle strength and agility while reducing your risk for overheating. Talk with your doctor or physical therapist about how you can move your workout into the water and reduce your MS symptoms. Along with a healthy diet, regular exercise, and your prescribed medication, vitamin supplements can help reduce and manage your symptoms by reducing inflammation, increasing energy, and improving mental and physical agility. You don’t necessarily have to only take vitamins in pill form to get the supplements you need. For example, cooking with turmeric or curry powder can give your foods a great taste as well as your body a full serving of zinc. If your MS symptoms affect your eyesight, zinc can improve vision and reduce eye pain and complications. Chamomile, ginkgo biloba, and ginger are also great herbal supplements that will reduce inflammation and joint pain to help increase your mobility and agility. However, if your symptoms are flaring up regularly and complicating your ability to live a full and happy life, oral vitamin supplements like MitoQ can help you get the energy you need to take on the day. 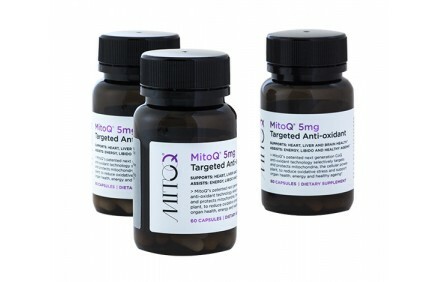 Selected by a globally recognized testings program for its significant potenteial in improving general health, MitoQ specifically targets the mitochondria in your body and helps rebuild damaged nerves to reduce your unique symptoms. And, because it’s an antioxidant, it cleans toxins from your bloodstream in order to boost your energy levels and help you take on the day. If you’re interested in adding supplements to your MS routine, talk with your doctor about how you can add MitoQ to your regimen. Don’t let MS rule your life! Just because you have MS doesn’t mean that MS has you. Take charge of your MS flares and start managing and reducing your symptoms.